Okay folks, all I can say about this analysis is better late than never. This was too good a race not to discuss. When the livestream I was watching cut out midrace I struggled to find another, and in the time since I’ve struggled to find video. There finally is one available here but I’ve only got time to either watch it or write. So I still haven’t seen the full race and I’m just going to write based on what I’ve got. I think you’ll find it useful anyway. When I finally found my way to a video stream that was working, I was just in time to see Shalane Flanagan approach the finish line and break the tape. Eff yeah! It had struck me during the part of the race that I saw that not only was Mary Keitany not taking off like usual, but her head was tipped right from very early on–her “tell” that she’s working hard. I’ve never seen that happen so early. So once I got over my initial shock and amazement I realized that indeed the signs had been there that Mary wasn’t up to her usual level of performance. Shalane on the other hand looked overall true to her usual running form, with all its strengths and weaknesses. Comparing her running to her first NYC marathon she looks less mobile in the torso now, with less lateral shifting through her whole spine and a less fluid gait. 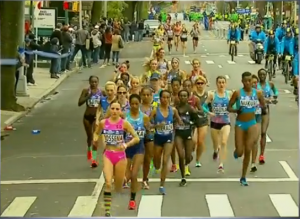 In this clip you can see how much harder her feet hit the ground than Daska’s or Keitany’s. Even so, in the category of her strengths I’d put her great pelvis mobility in the frontal plane–she’s allowed her pelvis to tip side-to-side quite easily for as far back as I can recall, and this gives her functionally longer legs. It also gives her a better ability to store and use elastic energy since the fascia of her trunk also gets used for that purpose and not just her legs and feet. Another strength is her moderate forward lean, which seems relatively free of any excess muscle tension or distortions. In the category of weaknesses I would put her armswing, which has a very sagittal action even though she allows her hands to come to her midline. The large distance between her hands and her chest–she swings them quite far forward–pushes her torso backwards and prevents her from having a deeper lean. It also raises the muscle tone in her upper body, interfering with her weight shift and raising her effort overall. Another significant weakness of her form is the timing of her ankle dorsiflexion. Though it’s better than it used to be, she still does it earlier than many of her East African competitors. In fact, it’s pretty normal for runners raised in the US and Europe to dorsiflex the ankle in the swing phase before the middle of the shin passes the stance leg. This synergistcally contracts the hip flexors and pushes the pelvis backwards relative to the stance foot. Runners who do this often feel soreness and fatigue in the hip flexors, lower abdominals, and quads, and struggle with legs that seem to get a great deal heavier and more sluggish as they tire. I’ve longed for a number of years to see Shalane improve these two elements of her form, as I’ve wanted to see her really run up to her potential. But of course running form is only one of the many elements of performance and not necessarily the one that carries the day. (For more about that and other considerations in my analyses, please read this.) As all the factors played out on this particular day, I really loved seeing her win. As for Mary Keitany, I wrote about what I felt was a deterioration of her form in September after the Great North Run, but in this race I didn’t see what I saw then. She seemed back to her old self, without any noticeable pulling back of her head. I was very glad to see that. Third-place finisher Mamitu Daska runs with the high hands and what I’ve decided to call the figure-8 hand movements of Tirunesh Dibaba and so many other Ethiopian runners. What I found worth pointing out is her significant underpronation on her left foot and the obvious braking and asymmetry that created. I don’t know if this is her normal form or if she was dealing with pain or injury at footstrike on the left side, but it’s worth getting a sense of what that looks like because it appears commonly in runners who do have pain. You can see it around this point in the race. You can see her in action here. As a result, her chest was quite lifted, even though overall she did have a forward lean. This kind of technique can create some serious difficulties with breathing, as the downward movement of the diaphragm is limited. A wider armswing is another effect of this movement strategy, as the contraction of the abs reduces movement of the torso necessary for weight shift, so the arms need to compensate. It also requires a great deal of leg strength, as the contraction of the abs to pull the top of the pelvis backwards interferes with the ability of the pelvis to move in other planes of motion–namely the frontal and transverse, both very important for running. Consequently the legs don’t get the benefit of the small movements of the pelvis to assist with stance and swing and need to work harder. Furthermore, no one manages to contract only their abs to pull their pelvis upright. The upper hamstrings always activate as well. This creates a restriction in the forward swing of each leg and in my professional experience can lead to hamstring problems. In addition, the more upright pelvis she achieves means her hip joints are more hyperextended by the end of stance than if it had a normal anterior tilt (I explain that in this analysis). So she runs out of hip extension sooner than she might and this means she has to go into the air sooner. All of this adds up to very short ground contact time and a lot of air time, presumably, and that’s also what it looks like Dossena is doing. That might not sound bad, but consider the work involved. Allowing her pelvis to tilt anteriorly would have improved Dossena’s breathing, increased her stride length, made her armswing more compact, and decreased the work in her legs. All of this would have added up to much lower effort and–given her obviously remarkable strength and endurance–a better finish. Just because you can pull your pelvis upright and still finish 6th in the New York City Marathon doesn’t mean it’s your best strategy for success. 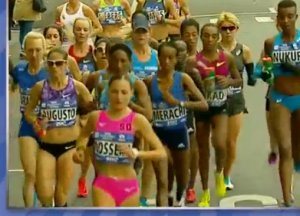 Because it was mostly the first part of the women’s race I saw, I have less to say about the men. I can’t argue with winner Kamworor’s form, all the pieces are there including a good lean, a free head, a mobile torso, and hands close to the heart. Interestingly, it looks like he’s got the opposite arrangement of the classic asymmetry I’ve written about before, with his left foot more turned out and pronating more, right foot more parallel and pronating less, and his vest sliding to the left. That would make him the first person I’ve ever seen do this. I look forward to opportunities to watch him run again in the future. The finish was quite interesting, as Wilson Kipsang kicked to gain on Kamworor right up to the end. You can see that bit here. Though he was clearly gaining, what struck me was his need for a change in technique for this job. He runs really fast marathons with his low arms but they just don’t facilitate a burst of speed. And in the final seconds he changes his arm action to a more sagittal (front-to-back) movement, which does not make for faster running. Quite the contrary. Moments like this always make me think of the finish of the 2005 NYC marathon, with Paul Tergat masterfully shifting his arm technique as he approached the finish line to pull ahead of Ramaala and win. The value of technical control, of being able to make powerful choices about how you’re moving when it most counts, is I think vastly underestimated in distance running. This race is a case where it would at least have brought Kipsang yet closer to Kamworor at the tape. Like what you just read? 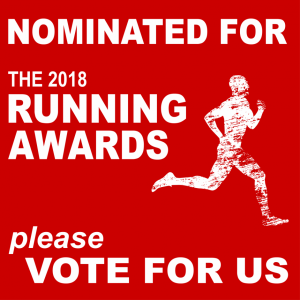 Then please vote for The Balanced Runner™ as best running blog in the Running Awards. Vote here in the Publications and Online category. Thank you very much! What about NAZ elite runner Kellyn Taylor ? To my eye, she has no forward lean, a straight back and appears to ‘sit’ on top of her pelvis when she runs. What do you think of her style ?